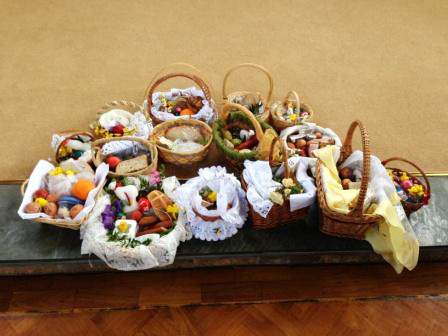 There was a ceremonial event of Food Blessing for the Polish Community Easter Baskets, at the church of the English Martyrs in Horley, on Holy Saturday. Święconka, meaning "the blessing of the Easter baskets," is one of the most enduring and beloved Polish traditions on Holy Saturday. With roots dating back to the early history of Poland, it is also observed by expatriate and their descendants Poles in the U.S., Canada, the UK, and other Polish Parish communities. Baskets containing a sampling of Easter foods are brought to church to be blessed on Holy Saturday. •	ham - symbolic of great joy and abundance. The food blessed in the church remains untouched according to local traditions until either Saturday afternoon or Sunday morning. The basket is traditionally lined with a white linen or lace napkin and decorated with sprigs of boxwood (bukszpan), the typical Easter evergreen. Poles take special pride in preparing a decorative and tasteful basket with crisp linens, occasionally embroidered for the occasion, and boxwood and ribbon woven through the handle. 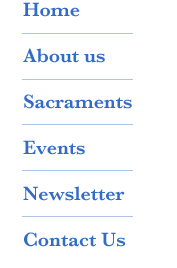 Observing the creativity of other parishioners is one of the special joys of the event.